Ellen Stimson and her husband had such a wonderful time in Vermont that they wondered what living there would really be like. "What if we stayed here . . . forever?" So began the series of adventures and misadventures of Ellen Stimson's hilarious first book, Mud Season. Now, having settled the family in Vermont's rich muddy soil, they are faced with new challenges of raising kids in the paradise of this very small, very rural town. Good Grief tells the tales of the hopes and dreams of parents just trying to do their best--and not always succeeding. Imagine being the mom of the kid who peed on his teacher's chair . . . On. Purpose. Now imagine the governor asking you about it Good Grief is all about the inevitable moment right after somebody says, "What next?" 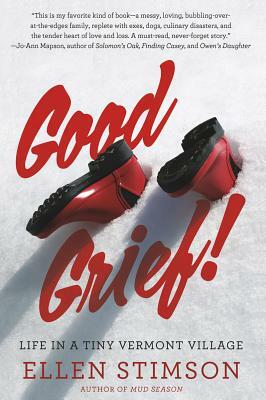 Ellen Stimson's irrepressible optimism and good humor prevail as she, her two husbands, their three kids, and various much-loved pets face down real life, and even death and grieving, with good humor intact. This is life in a state where everyone knows everything, and everything is everybody's else's business.